A new year is just around the corner, and for many of us, it’s a chance to leave behind negativity and fear that may have plagued 2016. Regardless of whether our personal years were good or bad, 2017 holds the opportunity for a fresh start. If you have hopes to start the new year on a positive note, you may want to give yourself a refresh by cleansing negative energy from your mind, body and living space. Even if you don’t believe in energy cleansing, doing so can be a fantastic mental ritual to help gear you up for the coming year. Here are five ways to remove negative energy from your life so that you can kick off 2017 with tons of positivity. Plants are deeply cleansing, and there’s nothing weird or new-agey about it. They literally purify the air in your home through their natural respiratory system, helping to remove toxins and release fresh oxygen into your living space. Add plants around your home to clear your air and boost your mood. Some of the most cleansing plants to add to your decor are snake plants (also called mother-in-law’s tongue), peace lilies and spider plants. However, showcase whatever plants best boost your mood! If the sight of roses cheers you up, pick some up from the market on a weekly basis to showcase in your home. Crystals have magnetic properties. This is a scientific fact, which is why crystals are used in various technologies and electronics. Even beyond that, though, some people claim that using crystals in close proximity can affect the frequency of your own body, allowing for healing and opening the flows of positive energy. Decorate with crystals throughout your home. You can add them to a spiritual alter, showcase them as decor, or wear them as jewelry. Black tourmaline is an amazing crystal for promoting positive energy, while turquoise helps heal past hurts, both physical and mental. For thousands of years, sage has been used to clear spaces of negative energies. You can burn sage very casually, simply hanging it from a string and letting it burn, just as you would incense or a candle. 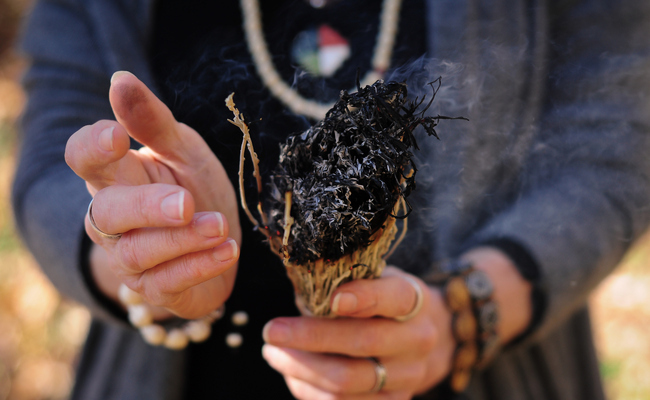 However, you can also take the ceremony up a notch by smudging the sage around your home. Salt is also known to cleanse negative vibes, which is why it’s superstitiously associated with warding off bad spirits and mythical creatures. You don’t have to sprinkle salt over your shoulder to enjoy its protective essence, though. Sprinkle a bit of salt on your carpet before vacuuming as you would a carpet powder. Just be careful to only use a very small amount, and be sure to get it all vacuumed up—you don’t want to attract bugs or mice. Even easier is taking a bath with epsom salt. On New Year’s eve or the next full moon, prepare a warm bath and add in epsom salt, some flower petals and your favorite essential oils. Finally, use guided meditations to get you into the right headspace for 2017. There are meditations all over YouTube specifically designed for the ending of one year and the beginning of another. You might also consider doing a guided chakra-clearing meditation to clear up any energy blocks and get your body and mind ready for the new year. Donate something and bin something. Try rehanging the paintings and photos around your home in different places. Add a new one. Also rearrange your books to different shelves and rooms. You stop seeing them when you are used to them. These same ideas will work for getting rid of bad vibes from 2017 and having a good 2018.